Todd Gebhardt is the owner/developer of Granite Ridge Apartments. He has lived in this neighborhood a long time. It's had its challenges, both social and architectural. He knows about them, since he's owned some properties there for years too, and takes care of things in a very 'hands-on' fashion. In fact, many of the tenants of his apartments only know him as the landscaper/repair guy. The site he chose to try his first big, from-scratch developent project was a rough lot, disused for years. Todd saw the need for apartments for students from the nearby expanding Madison College, and for young professionals from new tech companies locating on Madison's Northside. He reasoned that new, good quality housing would be a good thing for his neighborhood. 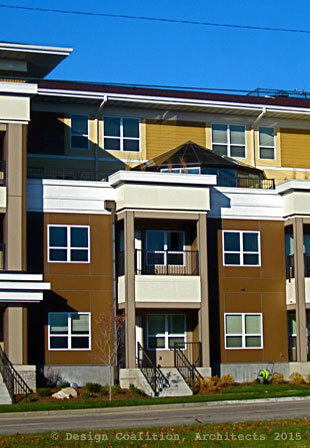 Granite Ridge includes 60+ apartments and 7,500 square feet of commercial space — shops and Todd's own company, Northshore Rentals. 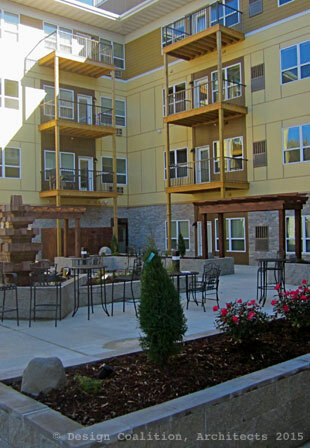 Todd was keen to include community amenities for his tenants that other owners might forego in order to save some money, such as a shady courtyard (above, left) with fountain and planters and a third-floor sunspace and deck with long views and a sheltered, sunny micro-climate (above, right).